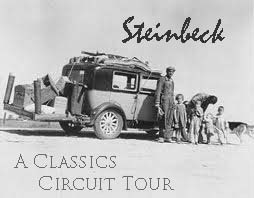 On Monday, we begin our Steinbeck Classics Circuit Tour. The following sites are where John Steinbeck will be visiting on each day. Check back each morning to click over to the reviews. Thanks for following the tour, and enjoy! This entry was posted on August 13, 2011, 10:56 am and is filed under Schedules and Updates. You can follow any responses to this entry through RSS 2.0. Both comments and pings are currently closed.